Pauline Jacobus was an accomplished china painter who taught the subject in her Chicago home. After developing an interest in art pottery, she went to Cincinnati in 1881 where she studied at the Rookwood School for Pottery Decoration. She founded the Pauline Pottery in 1883. 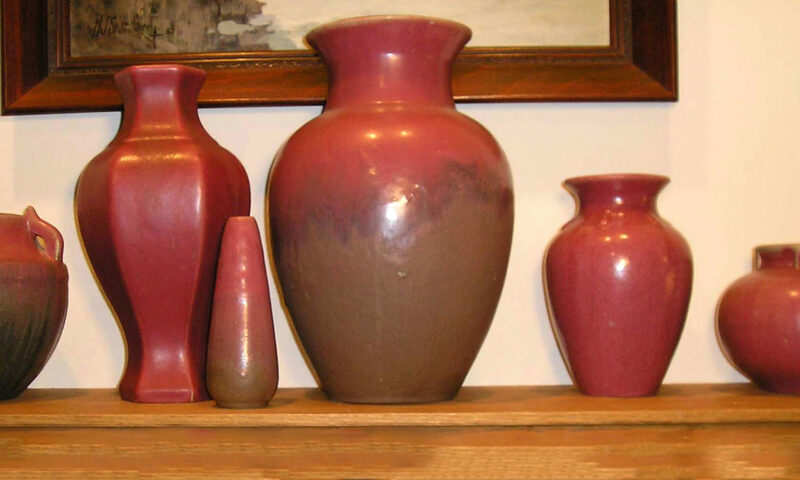 It was the first art pottery company in Chicago. Jacobus moved production to Edgerton, Wisconsin in 1888 where a high-quality white clay was available. At the height of production, the company employed about 40 people, and its art pottery lines were sold in Marshall Field’s in Chicago and Tiffany’s in New York. In addition to its art pottery production, the company had a contract with the Bell Telephone Company to produce porous ceramic cups for electric batteries. When dry cell batteries eliminated the need for this product, the Pauline Pottery was forced into bankruptcy in 1894. Pauline Jacobus continued to make art pottery until her retirement in 1911, first with Pauline Pottery’s successor firm Edgerton Pottery from 1894 until 1902, and later at her home as an independent studio potter. The Pauline Pottery was produced in a wide range of shapes and forms including covered jars, teapots, cups, lamps, ewers and vases. Floral and geometric designs predominate. Early pieces may be marked Pauline Pottery in block letters, while later pieces often bear a mark resembling a crown. However, there is little uniformity in Pauline markings, and unmarked pieces are not uncommon. Pauline Pottery is difficult to find today and avidly sought by collectors. Visit the page for the 2008 Show: Pauline & the Pottery of Edgerton, Wisconsin to see a gallery of pieces from Edgerton, Wisconsin studios, especially Pauline Pottery.